I have to admit that I was skeptical about a pie with rhubarb. Strawberries and apples? I like them. Rhubarb? I’m not so sure. I’ve always thought of rhubarb as a vegetable and I’ve never associated vegetables with desserts. It’s kind of like pumpkin pie or carrot cake – don’t they just exist so that people can eat whipped cream and cream cheese frosting? I’m kidding! But I thought, let’s give this combination a shot. Would you believe, this was my first taste of rhubarb? Yep. I had never eaten rhubarb before in my life. I have to say that I was pleasantly surprised – it was pretty good. The pie had a nice sweetness from the apples and strawberries but I found that I really enjoyed the tanginess from the rhubarb. 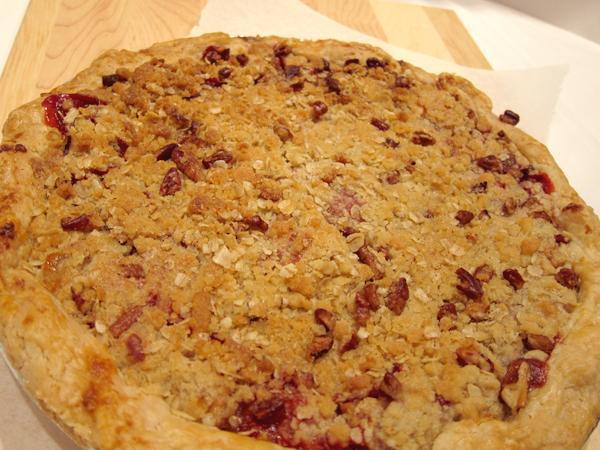 And the streusel topping gave the pie a nice sweet crunch! I liked that the pie itself wasn’t heavy – I still had room for a piece (or two) after a family get together. And since rhubarb season is here, why not give this recipe a try! Recipe notes: If you are short on time, you can use a ready-made pie crust from the grocery store. Make sure the apple cubes, strawberry and rhubarb pieces are all similar in size. This will help the filling to cook evenly. Be careful not to overcook the rhubarb while it’s on the stove or it will become soggy. After adding the streusel topping, I sprinkled a bit of a cinnamon sugar mixture on top of the pie. Finally, I scaled this recipe down from my baking class. The original recipe made enough for two pies! Add shortening and flour to a large mixing bowl. Rub the shortening into flour using your fingertips until the pieces of shortening are no bigger than the size of peas. The texture of the flour mixture will resemble. Dissolve salt and brown sugar in the water. Slowly add the water to the flour mixture until a dough begins to come together. You may not need to add all of the water. If you press pieces of the flour mixture together and it holds, you do not need to add any more water. Be careful not to over mix. Transfer the dough to a floured surface or a pastry mat and shape into a round disk. Wrap the disk in plastic wrap and refrigerate for at least 30 minutes. The dough will keep in the fridge for up to a week. Remove the dough from the fridge, once 30 minutes has passed. On a lightly floured surface, roll the dough out to a 12″ circle about 1/8″ thick. Be sure to check on your dough as you’re rolling it out. You may need to add a few sprinkles of flour to keep it from sticking to the rolling pin. Carefully place the dough onto the pie plate and gently press the dough into the plate. Keep an overhang of about a 1/2″ of dough. Use kitchen scissors or a knife to trim the excess dough from the sides of the plate if necessary. Using your thumb and forefingers, flute the rim of the pie shell or use a fork to create a decorative edge. Place pie plate and shell back into the fridge, until you’re ready to fill and bake the pie. In a bowl, mix together the oatmeal, flour, brown sugar, pecans and cold butter using your hands, a pastry blender or fork. The mixture should have a corn meal like texture. Place into refrigerator when done. Peel and core the apples. Cut apples into cubes and making sure they are similar in size to the pieces of rhubarb and strawberries. Place the apple cubes into a bowl, add the lemon juice and mix together with the apples. Add butter, brown sugar, lemon zest and rhubarb to a pot and sauté for about 2 minutes on medium heat. Stir mixture occasionally. Add the apple cubes and cook for another 1-2 minutes. Add the cornstarch, constantly stirring the mixture until it thickens. This should take about 3-4 minutes, then remove from heat. Transfer the apple and rhubarb mixture to a bowl and allow to cool in the fridge. Once cooled, add the strawberries and stir to combine. 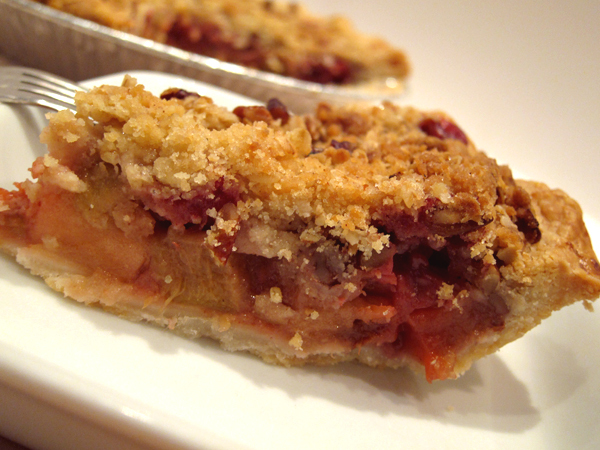 Remove the pie dish from the fridge, add the filling and top with streusel. Bake for about 1 hour at 375F. Looks mouth watering! I had rhubarb (in a pie) as a child and HATED it. I wouldn’t go near the stuff again, but this might tempt me to forgive the vegetable and try it again.